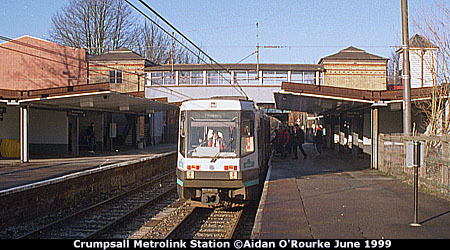 GREETINGS FROM CRUMPSALL, three miles (5km) north of the city centre, and just 8 minutes from Victoria Station by Metrolink. Crumpsall is a pleasant residential suburb with a wide mix of housing at competitive rents and prices, pleasant parks, good shops, some highly regarded schools, good access to the city centre and M60 motorway, convenient for North Manchester General Hospital and with a diverse, multi-cultural community. Two of Manchester's most senior politicians live here: Councillor Richard Leese and Graham Stringer MP. 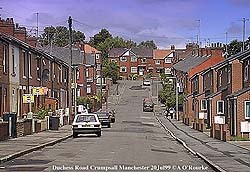 In the 19th century, Polish-French composer Chopin is reputed to have stayed in a house at the top of Crumpsall Lane. With its long, leafy avenues, green spaces, gentle hills, rambling Victorian houses converted into apartments, attractive terraced homes and bunaglows, what better place could there be in Manchester to find student digs, bring up a family or enjoy retirement? If only the reality was as rosy as an estate agent's description, life would be a lot simpler. 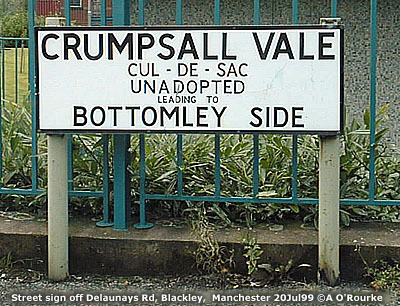 The unfortunate fact is that Crumpsall, like other areas of Manchester has had its share of ills. Most recently, that doom-mongering BBC documentary tv programme "Panorama" arrived in Crumpsall, portraying the area as a no-hope sin-bin of collapsing house prices, unemployment, depression and crime. Yes, once an area is tagged by the media in this way, it can often go into the popular consciousness and become a self-fulfilling prophecy. 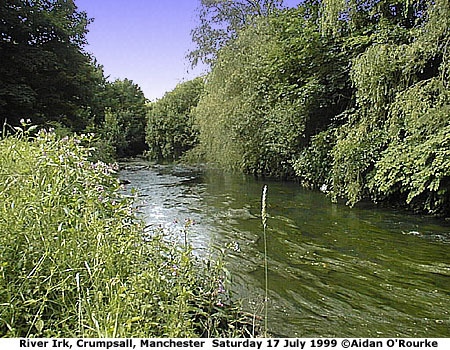 But shortly after the programme went out, Crumpsall residents Chris Humphreys and John Risby decided they weren't going to sit by passively, and started crumpsall.net, north Manchester's first community website. 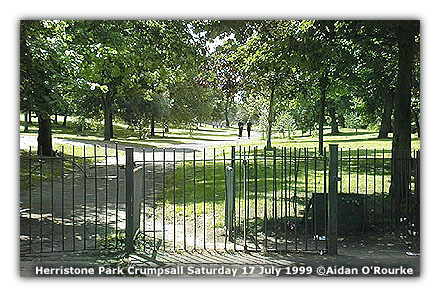 Their aim was to raise the profile of Crumpsall, develop a sense of community and provide a forum for discussion. Chris (short for Christine) and John showed me round and this is what I saw. 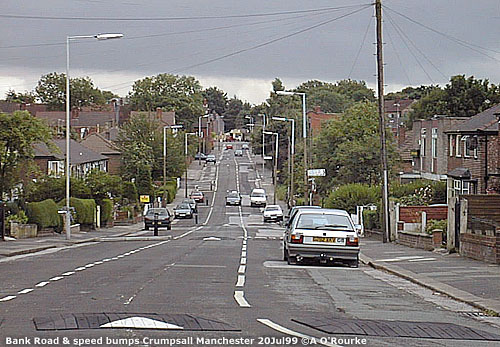 Crumpsall is just north of Cheetham Hill. Roughly it's the area bounded by Crescent Road to the south, Cheetham Hill Road to the west, the River Irk to the north and east and spilling across Middleton Road to the north west. 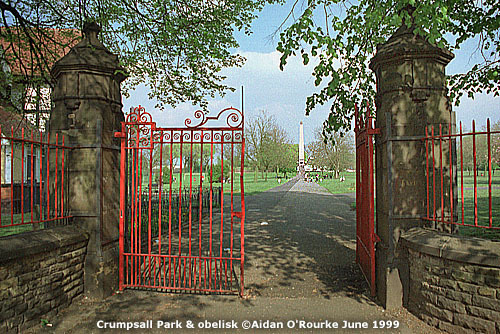 Due to ward boundaries, most of Heaton Park is annexed to Crumpsall, though it's closer to Blackley. There's a wide range of homes, from terraced cottages to big Victorian mansions. Prices in some areas are low - in the estate agents on Lansdowne Rd, I saw two bedroom flats for under £30,000 and semi-detached houses for under £20,000. 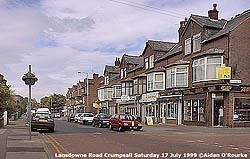 Landsdowne Rd is at the heart of Crumpsall and is a quiet shopping street with a supermarket, post office, hairdressers, pet shop and other stores. As elsewhere, speed bumps have been laid to slow down the traffic, and there's some evidence to suggest that their safety benefits are offset by negative factors. 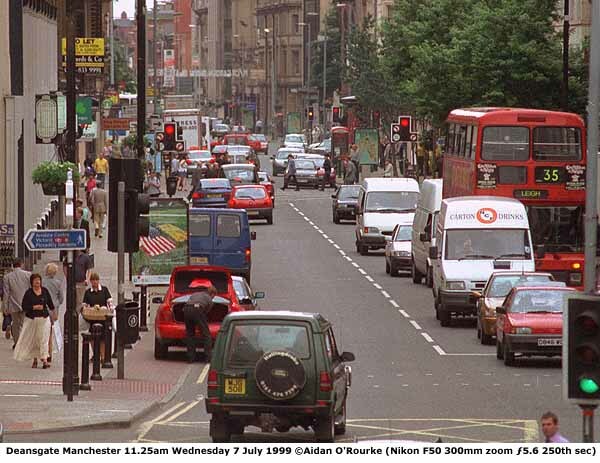 Drivers are possibly avoiding Lansdowne Rd and causing shops to miss out on passing trade. And on residential streets, chicanes and bumps can make properties less attractive to some buyers. 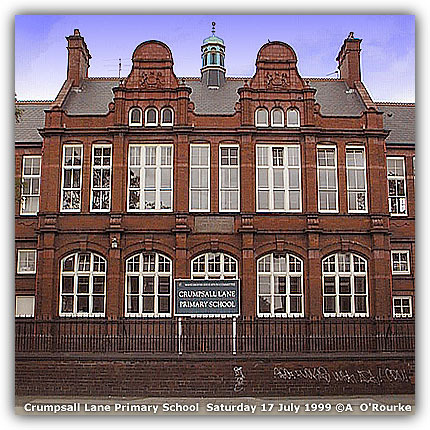 On nearby Crumpsall Lane you'll find the highly regarded Crumpsall Lane Primary School, housed in a grand red-brick 19th century Manchester Corporation school building. 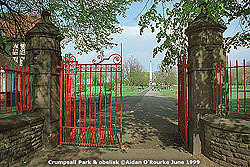 Just near Lansdowne Rd is Crumpsall Park, recently upgraded thanks to the efforts of the Friends of Crumpsall Park. When they heard the obelisk was to be removed from Market St last year they asked for it to be installed here. Another very pleasant green area is the long, narrow Herristone Park, nestling between two streets of semi-detached houses. Just down from here is an attractive though overgrown spot by the River Irk, currently spoilt by rubbish strewn on the ground and in the water. 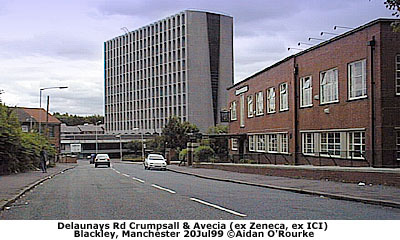 Neighbouring Blackley (pronouned "blake-lee") has the two largest local employers: Former ICI and Zeneca, now renamed Avecia following a merger. They have plans for a large business/leisure, residential park on waste ground near the River Irk. Next door is BICC who manufacture cables. And did you know that Blackley Tape, or black insulating tape, was invented here? Just up the hill along Delaunays Road is the recently extended North Manchester General Hospital. Crumpsall is a suburb of winding tree-lined lanes and roads some from the last century, many from the 1930's with typically English semi-detached houses.Many of the homes on Wilton Rd are beautifully kept, with flowers and well tended gardens. 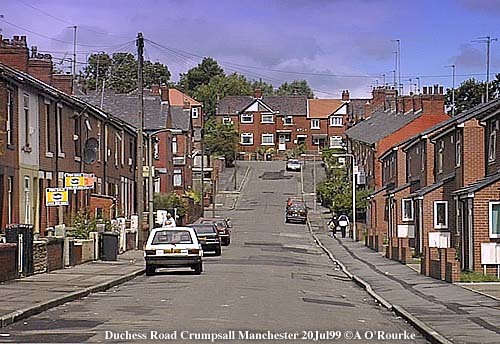 But further down near the Metrolink Station, Crumpsall isn't quite the leafy idyll it ought to be: Some of those houses have been converted into hostels for psychiatric patients and other people in care. 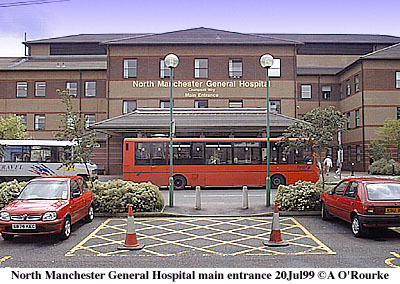 This is due to the proximity to North Manchester General Hospital, and other factors. While it's broad-minded of people to accept hostels into the midst of their community, few people would choose to live next door to one. There was a well-publicised case of a girl who was tragically burnt to death by her teenage boyfriend, who was living in a hostel. 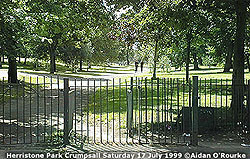 A gangland stabbing in Crumpsall Park and the burning down of part of the Abraham Moss Centre were enough to send out very negative signals. THE COMEDIAN BERNARD MANNING is well known for his controversial sense of humour and politically incorrect ways. 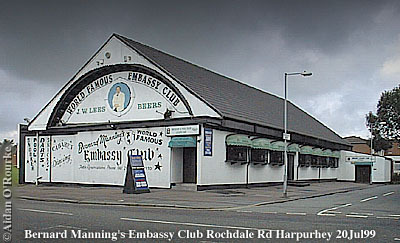 That's why he retreated from television to his "world-famous" Embassy Club in Harpurhey (10 minutes from Crumpsall), where he has presented his own show for over 30 years. It's popular with hen and stag-night parties, though I'm told anyone is liable to be picked on, particularly if they're foreign, though it's all said to be in good humour. But now the rotund, gravel-voiced entertainer has been told by his doctors he'll have to change his lifestyle - he suffers from angina and diabetes and recently suffered a heart attack. So the club will have to close. The end of an era? 15 MANCHESTER SCHOOLS closed for the last time last Friday. They included Corpus Christi on Varley St Miles Platting, and St Judes in Ancoats. 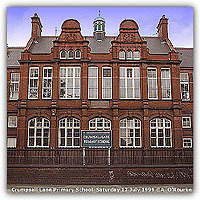 These two schools will come together to form Corpus Christi with St Anne, on the site of the present St Ann'e Primary in Ancoats. End of another era. 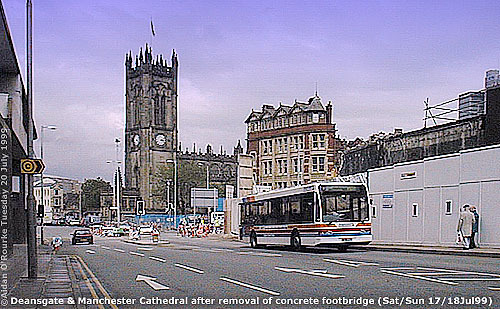 FOR THE FIRST TIME in over a quarter of a century, there is a clear view of Manchester Cathedral from Deansgate. Here's how it looked earlier this month (below left) before the dismantling, and today (below right) after the concrete footbridge was removed over the weekend. Start of a new era, I think, though I won't be able to get that bird's eye view along Deansgate (above) ever again. Hmmm, I'll have to buy a hot air balloon one of these days. It's cloudy and mild in Manchester tonight. Today was mostly overcast, though I caught a glimpse of a patch of blue sky at one point during the day. Yesterday was cloudy too. Sunday was overcast in the morning, but superbly warm and sunny in the afternoon. The forecast is for better weather to come. 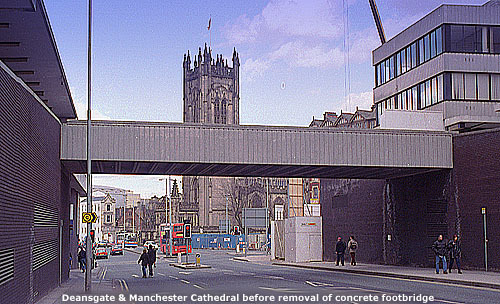 Check out Euan Kellie's excellent website Rebuilding Manchester for an overview of the reconstruction of Manchester city centre.